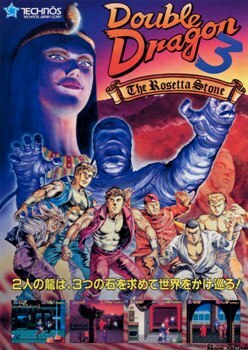 Double Dragon 3: The Rosetta Stone (ダブルドラゴン3 ザ・ロゼッタストーン, Daburu Doragon 3: Za Rozetta Sutōn?) is a side-scrolling beat 'em up produced by Technos Japan, first released as a coin-op arcade game and ported over to home computers. It follows the story of Billy and Jimmy after they completed two years of martial arts training. After their return home, they encounter a fortune teller Hiruko, who instructs them to find three Rosetta Stones before going to Egypt to defeat the world's strongest enemy. This page was last edited on 20 February 2016, at 21:24.